Symptoms are not accounted for by a mood disorder due to a general medical condition, a substance-induced mood disorder, or bereavement (normal reaction to the death of a loved one). Symptoms are not better accounted for by a psychotic disorder (e.g. schizoaffective disorder). A major depressive episode can be associated with special features: melancholic, psychotic, or atypical. Patients with melancholic features will report nearly total anhedonia. Depressed patients with melancholia must have three of the following symptoms: diurnal variation (depression worse in the morning); pervasive and irremediable depressed mood; marked psychomotor retardation or agitation; significant weight loss or anorexia; excessive or inappropriate guilt; and early morning awakening. Depressed patients with melancholic features have the best response to pharmacotherapy. Depressed patients that have psychotic features such as hallucinations and delusions are at very high risk for suicide even if they deny suicidal ideation. These patients should be sent for hospitalization immediately and should be under the care of a psychiatrist. Patients with atypical features have milder depressed symptoms. Depressed patients with atypical features must experience mood reactivity as well as two of the following: leaden paralysis (enormous effort to walk or exert); hypersomnia; rejection hypersensitivity (even when the patient is not acutely depressed); overeating or weight gain. These patients respond less to tricyclic antidepressants. Depressed patients may feel so helpless, hopeless, indecisive, or lacking in energy that physicians may need to take a more active role to engage the patient or to show their interest or concern. Again in major depression, the more common complaint is anhedonia and not depressed mood. Quiet listening and empathy are important approaches physicians can use with patients. A caring and nonjudgmental tone is critical to allay patient fears of the stigma of depression. Introducing the topic of depression with an educational statement first and then asking the patient for their response may help the patient not feel judged (example – “Patients who have had a heart attack sometimes get depressed or down after the event. Has this been happening to you recently?”). Making a statement instead of a question may allow the patient to have permission to be depressed and to know that you are willing and open to discussing the issue without judgment (example – “It sounds like you have been pretty down recently.”). Physicians may want to excuse depression symptoms in patients by attributing them to stressors or complications of life. Patients with increasing financial stress, work difficulties, and relationship problems should raise further possibility of major depression. These patients may be unduly critical of themselves but may also be critical of others including their doctors. It is important to recognize when they evoke frustration or anger in you so that you can avoid negative countertransference and avoid directing anger back at the patient. Major depressive episode is just one of several depressive spectrum disorders. In addition, depression may be associated with chronic medical illnesses. 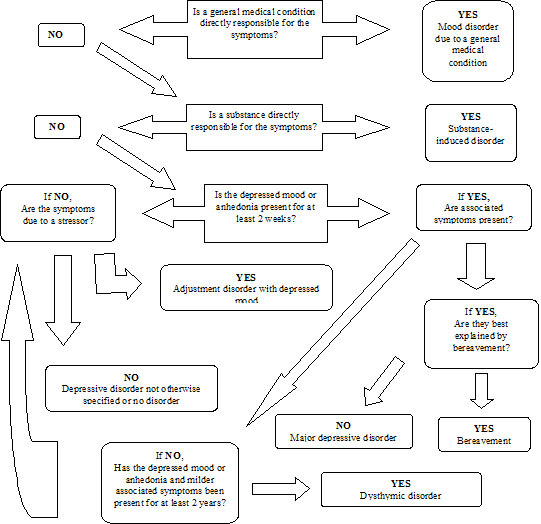 The following “depressed mood algorithm” can be used in primary care settings to assist in making the differential diagnosis. Alterations in mood may be related to underlying medical conditions. Depression may be associated with other chronic medical diseases such as cancer, stroke, heart disease, endocrine disorders, neurological diseases, epilepsy, gastrointestinal diseases, rheumatologic diseases, and severe anemia. This depression is independent of the psychological impact of the stress of the illness, and is patho-physiologically related to the underlying condition. Identification of co-morbid disease or conditions is important in patients with depression. Primary care physicians should consider initial lab testing such as thyroid-stimulating hormone, complete blood count, and chemistry panel. The findings of the complete history and physical examination may clarify the need for further testing for other diseases or syndromes. Patients who suffer from diabetes, ischemic heart disease, stroke, or lung disorders and who have concurrent depression have poorer outcomes than those without depression. Depressed patients, in general, have a higher risk of death from heart disease, respiratory disorders, stroke, accidents, and suicide. The correct answer is d. The presence of a chronic medical illness alone is not the most prevalent risk factor for developing depression. Depressed patients have higher rates of adverse health risk behaviors which may lead to higher risk of death from heart disease, respiratory disorders, stroke, accidents, and suicide. Chronic pain is known to be a risk factor for developing depression. Depressed patients may express maladaptive interpersonal behaviors such as anger or non-adherence which may cause some conflict with their medical providers. Screening, diagnosing, and treating depression after a myocardial infarction has been found to be of benefit in these patients. Depression may be induced by substances ingested for recreation or mood alteration or from their withdrawal. These substances include alcohol, hypnotics, sedatives, opiates, marijuana, amphetamines, cocaine, and other designer drugs (e.g., ketamine, ecstasy). Prescription drugs used for medical treatment can also cause mood disturbances such as blood pressure medication (e.g., reserpine, propanolol), anticholinergics, steroids, oral contraceptives, psychotropic medications, and antineoplastic drugs. Dysthymic disorder is a chronic form of depression. The signs and symptoms are milder but can cause much distress and dysfunction. The patient must have at least a two year history of complaints occurring on over half the days to make the diagnosis. It is important to distinguish dysthymic disorder from major depression because dysthymic disorder is more chronic and unremitting, and less responsive to pharmacotherapy. Family and friends may experience people with dysthymic disorders to be chronic complainers or pessimists. Depressed mood for most of the day, for more days than not, as indicated either by subjective account or observation by others, for at least two years. Note: In children and adolescents, mood can be irritable and duration must be at least one year. During the two year period (one year for children and adolescents) of the disturbance, the person has never been without the symptoms in criteria A or B for more than two-months at a time. No major depressive episode has been present during the first two years of the disturbance (one year for children and adolescents); i.e, the disturbance is not better accounted for by chronic major depressive disorder, or major depressive disorder in patial remission. The disturbance does not occur exclusively during the course of a chronic psychotic disorder, such as schizophrenia, or delusional disorder. The symptoms are not due to the direct physiological effects of a substance (e.g. a drug of abuse, a medication) or general medical condition (e.g., hypothyroidism). Bereavement is a normal reaction to the loss of a loved one. It is accompanied by insomnia, sadness, weight loss, decreased appetite. Symptoms resolve normally within 2 months and do not require psychotherapy or pharmacotherapy. When symptoms persist beyond 2 months, the possibility of a diagnosis of major depression exists. Pathologic symptoms include thoughts of death beyond the wish to be with the lost loved one, excessive guilt, an overwhelming new sense of worthlessness, severe psychomotor retardation, hallucinations (other than transiently hearing the voice or seeing the image of the loved one), or the inability to perform usual tasks and obligations. Adjustment disorder with depressed mood is diagnosed when the patient has depressive symptoms or complaints within 3 months of an identifiable psychosocial stressor. Stressors may include academic failure, job loss, or divorce. The stressor causes depressed symptoms that do not meet the criteria for major depression or dysthymic disorder. The treatment of choice is psychotherapy over pharmacologic therapy. Major depressive episodes that have a seasonal pattern, particularly with the start of fall or winter, or when natural daylight decreases, are considered seasonal affective disorders. The diagnosis can not be made if there is a clear psychosocial stressor related to the change in season. These patients respond to standard antidepressants and psychotherapy, in addition to light therapy.